Let’s face it, even if 3D printers have dramatically dropped in price recently, they still aren’t cheap. A good entry level printer is still going to set you back around 1000$. Quite a considerable investment, especially since you don’t know yet if owning your own little factory is really for you. Other than the price tag, the thought of using 3D CAD software may also deter you from getting started in 3d printing. There are some decent and even free entry level software packages out there but there is still a learning curve that comes with each one. The good news is that you can get started in 3D printing without owning a printer or being able to use 3d design software. 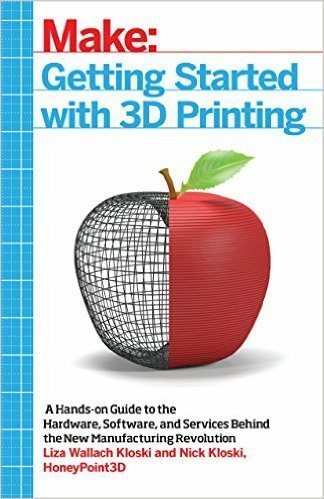 We will show you two easy ways to get started with 3d printing right away. All you need is your web browser, nothing else. Interested? Then just keep on reading! 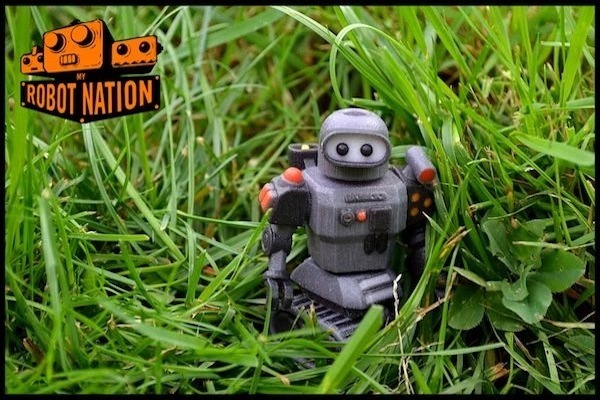 My Robot Nation, let’s you realize that childhood dream of building your very own robot! The service is super easy to use: armed with only Chrome or Firefox you can get start on designing your very own robot in minutes. 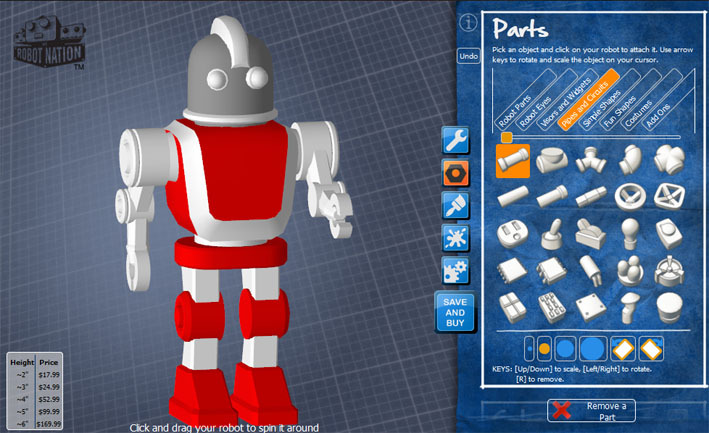 My Robot Nation uses a browser-based design tool which allows you to build your own robot based on ready-made parts. Navigate to http://www.myrobotnation.com/robots/new and you can start configuring your robot immediately. If you think that the standardized parts won’t allow for very unique creations, think again: all the parts and options offer over 9 billion possible combinations, so plenty of room to create your robot which is the only one of its kind. In a first step, you pick your robot’s head, torso, arms and legs. For each body part there is plenty of options to choose from, so make sure you pick those elements which fit together well. Once the basis of your robot is set, click on the ‘more options’ button. As a next step, you get to add parts such as eyes, visors, pipes and circuits to your robot. Once that’s done, you can proceed to apply color to the different elements. In a penultimate step, you can add stamps, letters or patterns to round off your design. In the final design step, you get to choose the pose of your robot by determining the exact position of its head, torso and arms. Note that the robots are made from non-articulated parts such that the pose you set is final. Once you have designed your dream robot, there is only a couple of steps left to bring it to life. In order to do so, hit the ‘make it real’ button: now you can give your robot a name and pick its size. Options range from 2 to 6 inches in height. An extra small robot will cost you $17.99 and a 6 inch, XL version will set you back $169.99. 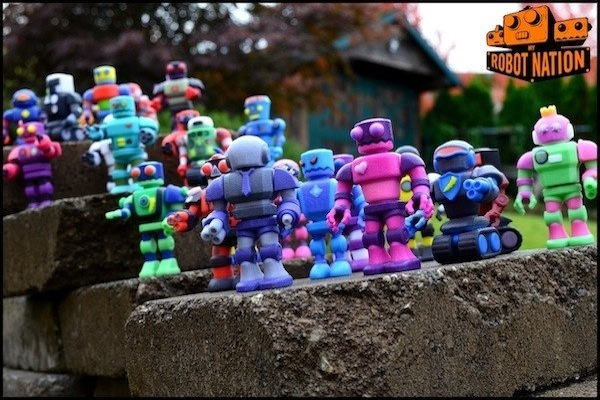 The robots are printed from a high performance composite resin which is initially in powder form. A binding agent, which also contains the robots colors, solidifies the resin powder during the printing process. The robots ‘grow’ at the rate of one inch per hour and once fully printed they still need to sit and cure for another 48 hours. At this point, the robot is finished, fully hardened and has a ceramic like surface. One word of caution though: the printed robots are not toys. Like a ceramic object you need to treat them with care since they can break if dropped or knocked over. Overall, My Robot Nation is a pretty cool service and ideal to gather some initial 3D designing and printing experience. The service offers an amazing variety of options to custom build your robot and a price range which fits any budget as well. The browser-based creation platform is intuitive to use and has no learning curve to it. A 10 day delivery time (10+ days for international shipments) and global shipping options make this service ideal for your first 3D printing project. CookieCaster is another neat and simple way to get started in 3D printing. 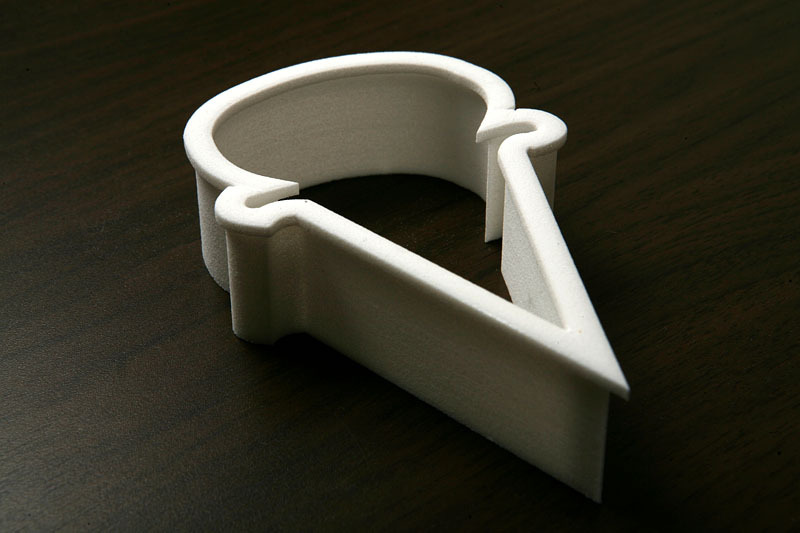 It is a service which lets you design, print and showcase cookie cutters. You can design your cookie cutters from scratch by using the pen tool. You first draw a two dimensional outline of the desired shape in straight lines. You can then go in and create rounded shapes by pulling the orange dots (anchor points) which appear in the center of each of the straight lines which you have just drawn. Keep tweaking the design until you have you perfect 2d outline. A little less obvious is how you add or delete anchor points: to do so, click either on the plus or minus sign located on the right hand side of the design window. 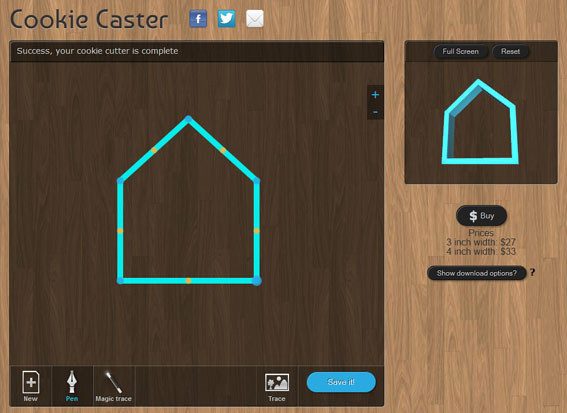 The tool will automatically show you where you can add or delete anchor points to modify your design. The small preview window on the right hand side immediately shows you how your cookie cutter will look like in three dimensions. Switch to the ‘Full Screen’ mode to be able to rotate your model and look at it from any angle you want. If you already have an image or hand-drawn sketch that you would like to work from, you can scan and upload it to the Cookie Caster design interface. Then, all you need to do is to apply the magic trace tool and the 3d model is created automatically based on the retraced lines from your original image. Last but not least, you can pick an existing cookie cutter from the gallery and tweak that design to your liking. Of course, if you see a shape in the gallery which you really like, you can also order it straight away without having to modify it any further. Once you have finalized your design you can proceed to place your order. The cookie cutters currently come in two standard sizes: 3 and 4 inches for $27 and $33 respectively. On a practical note, you may be interested to know that all the custom cookie cutters are dishwasher safe. CookieCaster is probably the easiest way to get started in 3D printing currently available on the web. However, there is a couple of drawbacks with the service that you might want to take into account: firstly, the service shows some signs of still being in its infancy with international orders or custom sizes not being part of the standard order process. Secondly, the delivery times are currently around 4 weeks, so don’t expect a quick turn-around of your orders. Despite these minor drawbacks, CookieCaster is worth a try for your first 3D printing project. The design tools are very user-friendly and the final product is something which you can put to immediate use. 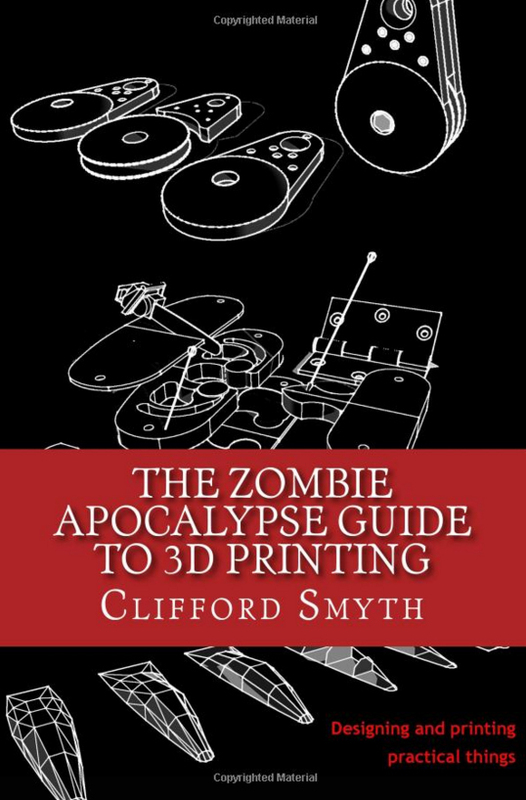 What better way to convince your wife that you do really need to buy that 3D printer? Indeed, we also believe in putting 3D printers to practical use by printing items that one can use in everyday life. We are currently printing more cookie cutters, the pictures will be posted soon! That cookie cutter you made on Cookie Caster came out great. Do you remember the sizes you chose to print it? Also can you tell us what brand of filament you used? Thanks. Take a look here for some guidance on size for the cookie cutters: http://3dprintingforbeginners.com/seasonal-3d-printing-3d-printed-cookie-cutters-part-1/. Generally speaking I wouldn’t scale them much beyond 50 x 50 mm and keep a thin wall for best cutting performance.